It was the costliest, most attended fair in history. Some predict it will be the last great fair where industrial giants invest untold millions for elusive publicity gains. The 51 million who visited the New York World's Fair were 19 million short of expectations. The general disillusionment and charges of mismanagement dulled the glitter of Flushing Meadows as surely as did wide-spread pilfering by visitors the last weekend. On closing day, one group of exhibitors were content with their lot: the religious at this most religious of world's fairs. Cardinal Spellman was reluctant to get involved at first, but the Roman Catholic Church scored a smashing box office coup. It offered, for free, a priceless show: Michelangelo's world-traveling "Pieta" and other art treasures. The Vatican Pavilion drew half the people who came to the fair. It was second only to General Motors in attendance. GM's pavilion cost it $2 per visitor. Although the Vatican had the most expensive religious pavilion, it spent only nineteen cents per head. The posh Christian Science effort cost $1.56 per visitor. 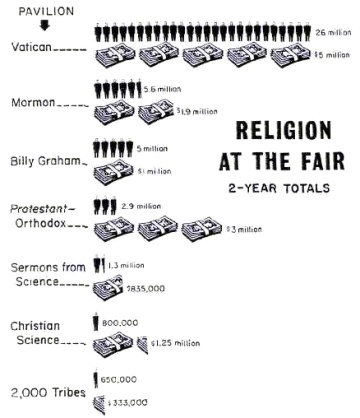 The religious pavilions as a whole spent over $13 million to draw 42 1/4 million people. In Madison Avenue terms, they notched a cost per thousand of $315. The two cults with pavilions at Flushing Meadow, Christian Science and Mormonism, report their experiment in pavilion evangelism paid off in thousands of converts. More modest results were claimed by two Christian evangelistic efforts, Billy Graham's pavilion and "Sermons from Science." The low-budget, low key Wycliffe Bible Translators presentation gave the fair its foreign missions element. Wycliffe squeezed into the fair after the deadline and despite some financial strain won unusual notice on TV networks, in the press, and from iconoclastic radio essayist, Jean Shepherd. The four pavilions not backed by a single church depended on donations to break even. Only Billy Graham managed to do it. The biggest debt was at the Protestant and Orthodox Center, which is behind $250,000. mostly because churches failed to meet pledges. It is counting on its controversial drawing card, the Parable film, to make up the difference at $35 per showing. Sponsors report more than 5,000 rental requests have come in, nearly half of them from Catholics. At the fair, the film drew only half a million customers at fifty cents a seat -- this despite pre-fair publicity in damnation from fair czar Robert Moses and continued notoriety through a diatribe at the nearby Singer Bowl from youth evangelist Jack Wyrtzen. The free Graham film, twice as long, attracted twice as many customers. Free shows helped to draw the masses. Location was another key factor. On this score, the Mormon, Protestant-Orthodox and Billy Graham pavilions had choice sites near the main subway-railroad gate. BILLY GRAHAM -- (Dan Piatt): More than a million saw the film, which called for commitment to Christ. About 5 per cent of the viewers sought counseling, a higher percentage than at most crusades. Those responding came from fifty five nations and follow-up work was often difficult. The usual procedure is to refer the person to a near-by church, but in some cases it was hundreds of miles away. An impressed Catholic priest from Belgium told Piatt he would try to persuade his colleagues to invite Graham for another European crusade. CHRISTIAN SCIENCE -- (Admiral Richard C. Renfro): "The pavilion was one of the finest things the movement has done in many a year. Its efforts have been widespread and indeterminable." The pavilion aimed to explain Christian Science to the outsider, but also succeeded in producing new members (how many, like all membership data, is a state secret). With the self-assurance typical of his church, Renfro said the pavilion was the "only one which dared mention God and explain who he is, what he is, and what we believe him to be." The church recently recruited the Protestant Pavilion's Dr. G. B. Rich to praise the beauty of the Christian Science effort in a publicity film. MORMON -- (Bernard P. Brockbank): The pavilion is credited with reaping thousands of converts, more than 1,000 in the New York area alone. The full results can't be known for years, because it will take that long for Mormon missionaries to contact the backlog of 750,000 persons Bronkbank says asked for counseling. "It changed the attitude toward the church in many parts of the country, especially the eastern seaboard. They are more tolerant toward the Latter-Day Saints, more ready to make an inquiry about us." PROTESTANT-ORTHODOX CENTER -- (Leonard Moreland): The impact was "excellent," the attendance higher than expected. Moreland thought that Parable was provocative but that its symbolism went over the heads of many viewers. One professional fairgoer claims to have seen it 101 times and to have gotten something different out of it each time. Polls showed Catholics liked the film better than Protestants and Jews liked it more than Catholics. Aside from the film, Moreland questions whether the twenty-two variegated booths at the pavilion did anything more than reinforce the constituencies of their sponsors. SERMONS FROM SCIENCE -- (W. Scott Nyborg): "We are thrilled . . . the acceptance by non-Christians was amazing." Among the 125,000 who entered the counseling room after the Moody Institute of Science shows, 3,300 indicated decisions for Christ. While most pavilions, and the fair as a whole, drew smaller crowds the second year, "Sermons" audiences were up 35 per cent. A large corps has contacted decision-makers, in some cases to find Mormons had already dropped by. Many nuns, intrigued by the four-step salvation process borrowed from Campus Crusade, asked for copies to present to their Catholic school classes. VATICAN -- (Monsignor John J. Gorman): "It was with some apprehension that the powers-that-be accepted the invitation to the fair. But I'm sure there are no regrets now. We had an opportunity to present the Church, and good reception from the Protestant, the Jew, and the atheist . . ."
WYCLIFFE 2,000 TRIBES -- (Francis B. Dawson): "It was definitely worthwhile. We expect it to pay off for ten years or more. We had a chance to meet young folks and counsel them about our missions. Many people hadn't heard about Wycliffe before." There were some heated discussions with people hostile toward missions, but many left with a different view, Dawson said. Wycliffe, like most, ended up spending more than it expected, and the gap between cost and gifts for the pavilion is $155,000. All bills have been paid, by shifting funds; but it is the first financial bind of this size Wycliffe has ever been in and there has been some controversy about it within the organization. The key problem: Wycliffe had planned to charge admission but soon found that if it did this, nobody would come. Webmaster's note... It's difficult to find the words to thank Eric enough for all of the work he put into this Feature. His research into the Billy Graham Evangelistic Association archives at Wheaton College presents a unique insight into how the Billy Graham Pavilion came to be at the Fair and reminds us of the importance of religion even as the Space Age was in full swing. Without his efforts, the Graham Pavilion Feature would not have been nearly so interesting and thorough.